*Figures in brackets are for groups of 20 or more, advance tickets, repeaters with used tickets for this exhibition and those who are wearing kimono. *Disability ID holders and one person accompanying them are admitted free of charge. Organized by: Yamatane Museum of Art and The Asahi Shimbun. Approximately 60 works in total are to be displayed. Japanese hearts have long been captivated by the beautiful sight of flowers. Spring, summer, fall, and winter—blossoms bloom in glorious variety throughout the year. Cherished motifs symbolizing the seasons in poetry and literature, flowers are also an eternal subject of paintings. The Yamatane Museum of Art has chosen this season, when spring is at its peak, to hold an exhibition with flowers of the four seasons as its theme. Plum, cherry, peony, lily, morning glory, chrysanthemum, narcissus, camellia: we are delighted to present paintings from the Edo period to the present depicting flowers as seasonal symbols. As subjects of paintings, flowers are matched with birds, insects, and human figures, for even richer variations that inspire our sense of the flavors of the seasons and delight our eyes. Edo-period Rimpa School painter Sakai Hōitsu, in paintings like The Moon and Plum Trees, with plums blooming on a moonlit night, and Chrysanthemums with Bird (a red-flanked bluetail), he captures the elegance of the flower's form. Turning to painters from the modern era, we encounter such works as Uemura Shōen's Cherry-Blossom Viewing, depicting a woman admiring the cherry blossoms. 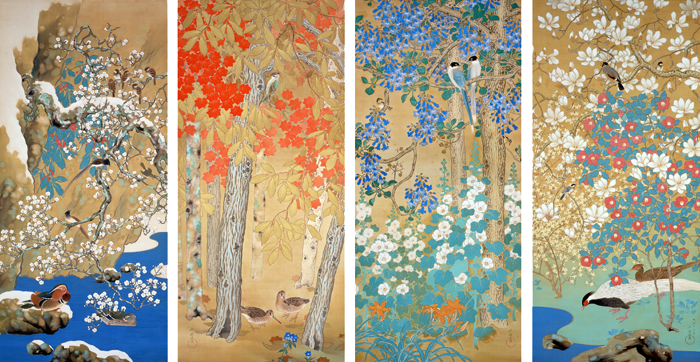 In Bird and Evergreen Magnolia by Kobayashi Kokei we see the evergreen magnolia in early summer combined with the Formosan whistling thrush (Myophonus insularis). In Yamaguchi Hōshun's Sunny Moments in the Rainy Season we see a hydrangea just after the rain has stopped. Flowers that capture the distinctive natural beauty of each season have inspired many superb paintings. These paintings are mingled with the language of flowers, flowers’ characteristics, the artists’ own words works conveying their feelings about their works, and flowers themselves, to introduce the appeal of these paintings of flowers from a variety of perspectives. The museum filled with flowers in full bloom becomes a garden of floral delights awaiting your pleasure.